Nicholas Cage is a machine. The man pumps out more movies in a year than Ron Jeremy. I'm not sure of the exact number, but I'm pretty certain he is appearing in no less than 19 flicks in 2011 alone. Does anyone remember a time when he once won a Best Actor Oscar for Leaving Las Vegas? No, they only remember his eterna-mullet in Next. Personally I long for the extremely plausible film classic Face Off. It seems like the "writers" of Drive Angry 3D had a sleepover and watched a marathon of exploitation road-trip 70's movies and came up with this screenplay. Nicholas Cage plays a guy who escaped from Hell to avenge his daughter's death and save his granddaughter from being sacrificed by a backwoods cult. Does that not sound crazy enough for you? Well add to that, Death himself (known as the accountant) trying to bring him back to Hell. Oh and there is also a hot girl thrown into the mix just we so have something to look at besides Cage's massive forehead. The equation for this movie is simple. The lone standout in this movie is the character of the Accountant, played by William Fichtner. He is the guy you have seen in pretty much everything but will never be able to remember his name. He seems like an updated liquid terminator from T2 but is doing his job with a smile. Nicholas Cage seems like he is falling asleep, often channeling Rain Man in his line delivery. The 3D is decent because it wasn't done in post-production. To be honest, this movie knows exactly what it is. It's not trying to be the next King's Speech, it's trying to be big, loud, angry-driving fun. I wish this was a new cult-camp classic, but it got a little tired. 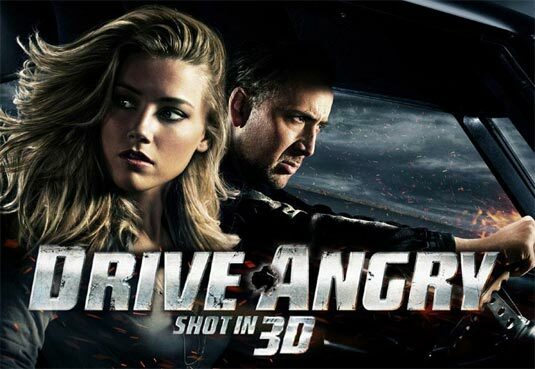 Drive Angry 3D receives 2 stars. Though I'm already lining up for Drive Angrier 3D. Don't laugh, you know some Hollywood producer is already thinking of it if this movie does well. Like honestly? I give it a D+ and you get all up in my grill, and then you go and give it a 2 out of 5? I'm no mathematician... but a 2 out of 5 might be lower than a d+. That being said, the system is all weird... so is an F an absolute zero or is it 61%? Oh no you di'nt! Don't u bee goin' all maff n' stuff on us...so just for the record, to clear things up, so there is no confusion on the matter "absolute zero" is measured in K...sometimes C, but never F, unless you are a absolute dolt. Comprende?